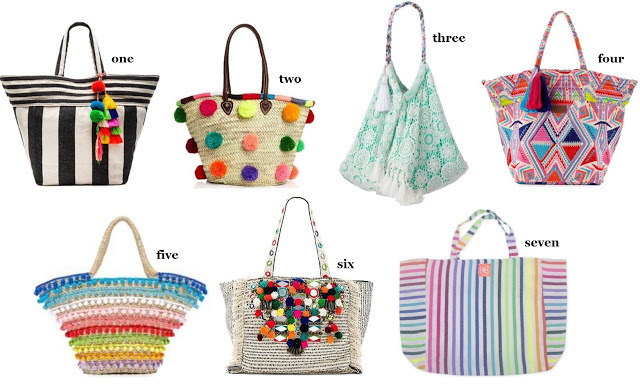 I know yesterday I talked about what I plan on bringing along on vacation, but I saved a different fun roundup for today since I thought it deserved its own post – beach bags! Listen folks, I am Jewish. I am perfectly content to lay in the sun for hours upon hours, but only if I have my water bottle, 2-3 magazines, a book, my Kindle, an array of sunscreens, moisturizers, and tanning lotions, a ponytail holder, chapstick, and sunglasses right next to me. Basically, I carry an arsenal down to the pool, and I need a cute bag to hold it all. For the past few years, my go-to has been a Mara Hoffman beach tote – my sister and I each have one and we trade them back and forth. Unfortunately, Mara doesn’t seem to be coming out with any new patterns or designs anymore, and so I am in the market for a new one. As you can see, I like a BRIGHT bag. Bring on the color and pattern and pompoms and tassels, the more the merrier. Even if you’re someone who doesn’t typically wear such girlie things, this is an item where it can be fun to try something new. I am leaning towards number six because it has a few things I like: the top fully zips and it also has a zippered pocket inside – perfect for my phone and the hotel key! I think the runner up is probably two (can’t resist those pom poms) or four (very cool pattern). It’s already spring and summer is around the corner. Treat yourself to a new bag. You deserve it.